Documenting a progenitor of an affiliated line of the Atlas family of Lake Providence, East Carroll, Louisiana. In 2010, the AtlasFamily.Org Genealogy Research Team hit the jackpot during our yearly research trip. We were able to verify the last slaveholder of Clora Evans Atlas (Born between 1845-1865 at Belle Meade Plantation, Carroll Parish, LA, died July 5, 1928 in Lake Providence, East Carroll, LA), daughter in law of King Atlas, Sr., along with the previous slaveholders of her mother, Susan Russell Evans, and paternal grandparents, John Russell and Margaret Russell. For details on how this information was discovered, see this post, this post, and this post. 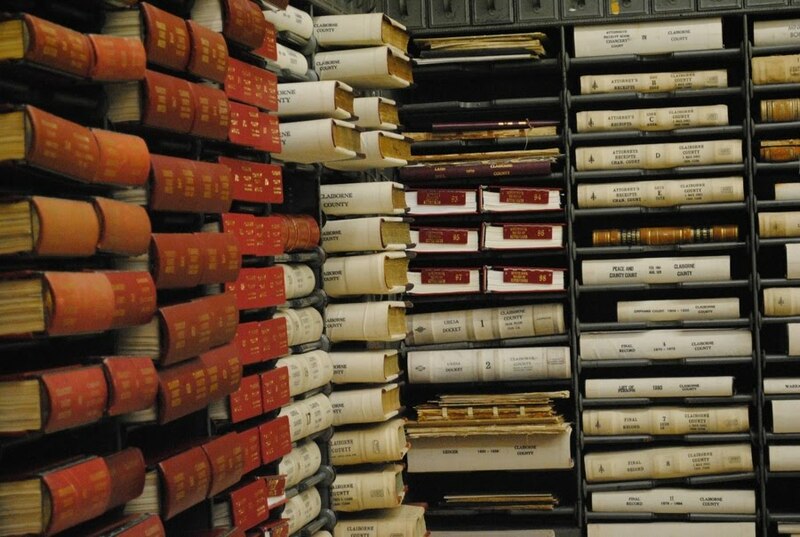 Answering the call to participate in the Slave Name Roll Project, we will continue to contribute records we have unearthed over the years in our research that mention the names of slaves. Our team always documents all slave names, even if they are never determined as being members of our family or F.A.N. Club and we always post the information online, either through this blog, or through USGenWeb. We have come across nearly 1,000 of them in just researching our family lines alone. New posts contributed to the project be titled based on the ancestor we were looking for when we discovered the listing of the formerly enslaved. Portion of the listing of slaves from number 3. A January 8, 1838 sale of the same 540 acre plantation and slaves from Robert Frazer Moore and his wife, Celeste Nichols Moore, and Joseph Nichols and his wife Elizabeth Louisiana Carney Nichols to William D. Bush (Claiborne County Deed Book R, Pages 219-222. Joseph and Elizabeth were the parents of Celeste. A November 2, 1844 estate inventory for William D. Bush by estate administrators, his wife, Lucinda Maria Bush (nee Bullock, Brashears, Jacobs, Grace) and Richard Valentine (Claiborne County Probate Court (Labeled Orphan's Court) Book K, Page 397)). The 1837 transaction does not note that slaves were included in the transaction or list the names of slaves, but the 1838 sale indicates that slaves were part of the transaction. Research efforts into whether or not the same slaves were transacted is continual. The table below notes the names of the slaves, their approximate age, and whether or not they were mentioned on the 1838 sale (number 2 above) and/or 1844 inventory (number 3 above), 1845 deed of trust (number 4) above, and 1846 1/2 interest sale (number 5 above). Claiborne County, MS Book R, Pages 219-222, Sale of 540 acre plantation from Robert F. and Celeste Moore and Joseph and Elizabeth Nichols to William Bush on January 8, 1838. Slave names noted above as 1838 Sale. Total number of slaves: 23, value: $23,800 (with corn, fodder, stock of horses, cattle, oxen and farming utensils), land value: $16,200. TOTAL: $40,000 delivered by David Bush. Plantation location was as follows: Caleb Jenkins land (east), Elijah Coleman land (south), Adolph Health land (southwest), John E. Hall land (west by waters called Widow's Creek). See the map above for the approximate current day location. Combined County Tax Rolls, 1839, Claiborne County, MS, line 77, Bush, Wm. D., 540 acres valued at $2,160, number of taxable slaves: 32. Total number of slaves: 32. 1840 US Census schedule for William D. Bush, Claiborne County, MS. Total number of slaves: 36. Personal County Tax Rolls, 1844, Claiborne County, MS, line 41, Bush, Wm D., Total number of slaves: 42. 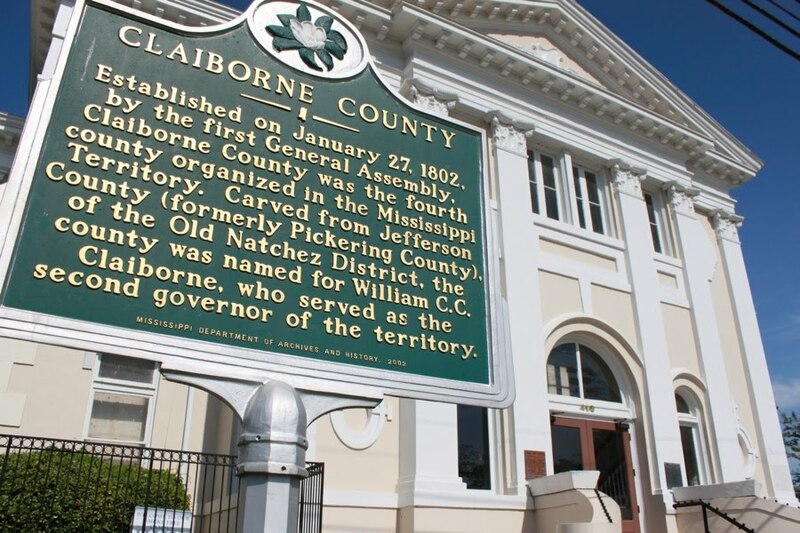 Claiborne County, MS Probate Court, Administrator Bond Book, 1840-1852, Pg 229, October 29, 1844 - Estate of Wm D Bush, Lucinda M. Bush and Richard Valentine made administrators over the estate for the bond of $15,000 by Wm. M. Randolph, probate judge. Ordered to make an inventory of the estate. Claiborne County, MS Probate Court (Labeled Orphan's Court) Book K, Page 397, November 2, 1844: Inventory of the Estate of William D. Bush. 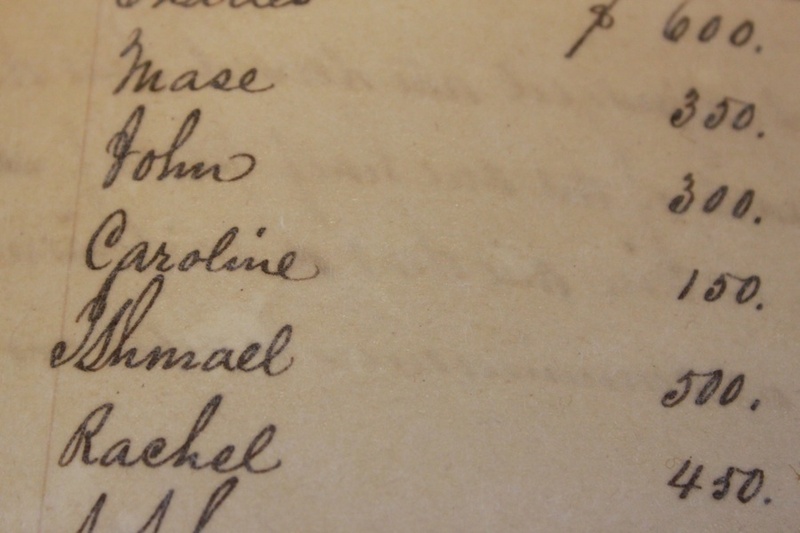 Slave names noted above as 1844 Inventory. Total number of slaves: 38. Yazoo County Mississippi, Circuit Clerk of Court, Deed Book N, Page 342, January 14, 1845. 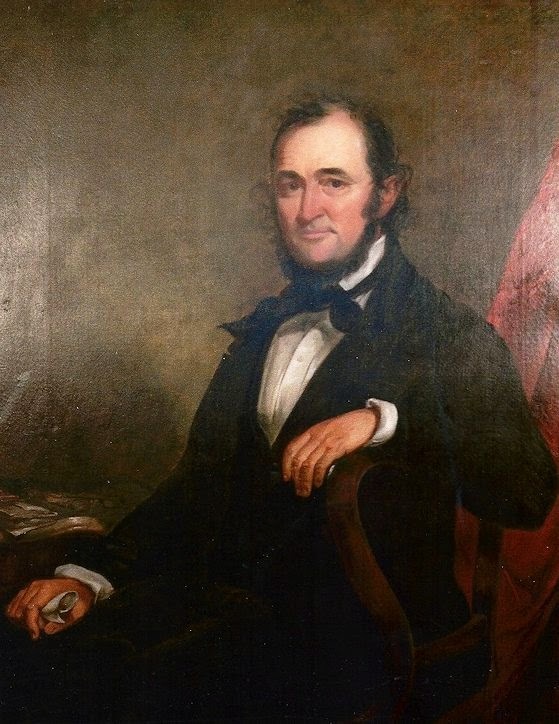 Charles C. Jacobs (of Missouri) and Lucinda Maria Bush; Bush owns lands in Hinds, Yazoo, and Warren Counties, also in Louisiana [Carroll/East Carroll Parish] and slaves: Sukey and children, Amy and children, John and children [Susan and Caroline], Sophia and children, May and children, total of 40. All estate and slaves sold to John Johnson of Yazoo County, MS in trust for $5; noted as marriage settlement. Claiborne County, MS, Probate Court, Book D, Page 126, Estate of William D. Bush, May Term 1846. Lucinda M. and CC Jacobs, appointed administrix and administrator of estate. Yazoo County, MS, Circuit Clerk of Court, Deed Book O, Page 570, Levi Beard to LM Jacobs, transaction date: December 29, 1846, filed February 22, 1847, half interest for the sum of $8,000 in township 9, range 2 west: north half of east half of south east quarter , west half, of southwest quarter, north half of east half of southwest quarter, east half of north east quarter, west half of northeast quarter of section 19; south half of east half of southwest quarter and east half of southeast quarter of section 18; west half of southeast quarter of section 18; slaves at plantation: Sukey and 4 children, Amy and children, Jess and children, John and children [Susan and Caroline], Isham and children, Harriett and children, Sophia and children, May or Mary and children, more than 40 slaves in all; and half moiety of all horses, mules and stock of every description, and farming utensils in Jacobs' possession. 1850 US Slave Schedules for Levi Beard, Carroll Parish, LA. 1860 US Slave Schedule for Levi Beard (listed as Peard), Carroll Parish, LA.